I usually don't have any doodling skillz, cubes not included. 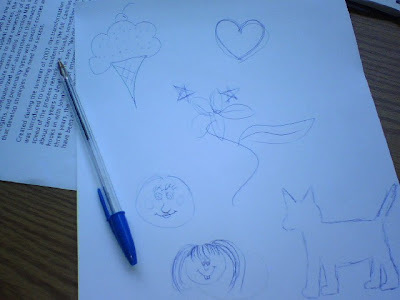 Today I just couldn't focus... so I did what people did to procrastinate before there were blogs. Look at that silhouette of a dog! Isn't it adorable? That is one impressively symmetrical heart, woman! Morgan, I admit, it is probably the best heart that I ever doodled. I must have been in the zone. SJ, Thanks, girl. I don't know if you can tell from the crappy photo, but she has some endearing buck teeth. I love doodling. Although for some reason I always end up drawing houses. What do you think that says about me?